France this week hosted The International Conference On Access To Civil Nuclear Energy, an international conference on peaceful use of nuclear energy in Paris, where representatives from about 60 countries debated on how to simplify the access to nuclear energy and to safeguard the utility of nuclear power from military deviation. In a speech to open the conference, French President Nicolas Sarkozy called on experienced developed countries and related international organizations to provide financial and technological aid to boost the global expansion of nuclear energy. "The important task today is to send the world a message about our shared determination to make civil nuclear energy a tool for peace, cooperation and prosperity. And to ensure that the coming nuclear world is.. a safe and stable one," Sarkozy said in his keynote speech. Sarkozy noted the imbalance of nuclear development, and urged the international communities to "put aside stereotypes and suspicions of ulterior motives." As more countries are seeking nuclear energy to cut energy cost and reduce fossil fuel pollution, it's not proper to restrain the privilege to a small group of countries, the President said. 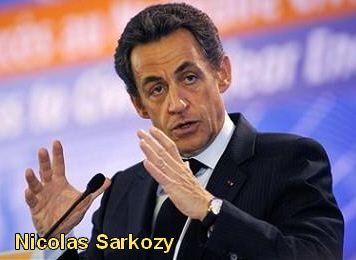 Sarkozy urged international financial institutions and development banks to finance civil nuclear energy projects. Domestically, the United States is working to reinvigorate our nuclear industry. At the same time, we are working with our international colleagues, including many here today, to ensure that all countries can access nuclear energy for peaceful purposes in a manner that minimizes proliferation risks. The chairman of the European Commission, Jose Manuel Barroso, underlined the importance to respect the non-proliferation regulations on nuclear access. "All countries have the right to civilian nuclear energy. ... But respect of the strictest safety, security and nonproliferation rules is not negotiable," Barroso said. IAEA chief Yukiya Amano also delivered speech at the conference, saying that civil utility of nuclear power has come to a renaissance and the global expansion of nuclear use is a solution to tackle the climate change and energy shortfall. "Nuclear reactors should not only be reserved for developed countries but should be accessible to all," Amano said.